↑ "North America Land Forms and Statistics". World Atlas.com. http://www.worldatlas.com/webimage/countrys/nalandst.htm. Retrieved on 16 June 2013. 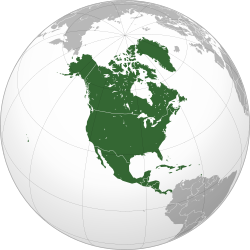 ↑ "North America Fast Facts". World Atlas.com. http://www.worldatlas.com/webimage/countrys/nafacts.htm. Retrieved on 16 June 2013. ↑ "Amerigo Vespucci". Encyclopædia Britannica. http://www.britannica.com/EBchecked/topic/626894/Amerigo-Vespucci. Retrieved on 7 July 2011. ↑ Robert Kaplan (16 January 2007). "What is the origin of zero? How did we indicate nothingness before zero?". Scientific American. http://www.scientificamerican.com/article.cfm?id=what-is-the-origin-of-zer. Retrieved on 19 February 2008.